Compare to Areca ARC-4036! Supports up to 8 SAS or SATA hard drives or SSDs via a single MiniSAS SFF-8088 cable. 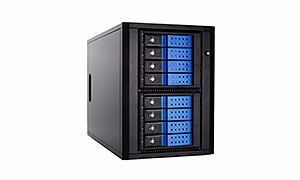 Built-in SAS expander board allows you to daisy chain additional enclosures as your storage needs grow. One SFF-8088 multilane MiniSAS female connector for host connection to a RAID controller or HBA in a PCIe slot of your PC. The interface will let you take advantage of all the bandwidth your hard drives are capable of. One additional MiniSAS connectors for daisy chaining or dual-connection capability to the host for cable redundancy and slightly increased bandwidth. Compatible with nearly all 3.5" SATA and SAS hard drives, including 14TB - "green" drives not recommended. Trayless design - no need to mount drives in trays. Just slide the bare drives in and close the latch.